Well, I've been putting this off long enough so I might as well get going. I figure the best place to start is at the beginning, so here it goes. I've always thought I'd adopt even if I had my own children, which hasn't happened, so I started looking into a domestic private adoption, then foster adopt and then finally realized that international adoption fit me best. I was hoping to adopt a new born here in the states when at the last minute a distant relative came forward and so that adoption fell through just weeks before the birth. It was tough to go through but not nearly as bad as so many other people have gone through. The sad thing is I've since heard that the boy ended up in foster care but has still not been released for adoption. He is now almost 6. It breaks your heart but that is what happens a lot in both private and state sponsored (foster) adoptions. So as much as those children need homes, I just knew that I couldn't take a child into my home and my heart then someday face losing him to someone the child doesn't even know and clearly doesn't have the child's best interest at heart. So then I explored international adoption. As a single woman the choices are fewer then couples, as far as where you can adopt from. Many countries only allow married couples over and under certain ages (some only have restrictions on the mothers age - it's a man's world, even in adoption), that have been married for a certain amount of time, etc. China is where most single women went but recently the laws have change and now it can take years with no real confidence that you would get a child. At first I was going to go to Russia but things started getting pretty tough over there. Right when I started working with an agency, well, life happened. First my mom and then my dad got sick. Everything was put on hold for a couple of very tough years. We lost my dad, which was truly heartbreaking, but Mom, thank goodness, is doing just great. She now lives with me most of the time except when she's off visiting with the rest of my brothers and sisters and of course all of her grandchildren. She is going to be a big help when I bring the baby (or babies) home. By the time my life calmed down enough to continue with my plans to adopt, Russia had basically closed it's doors to international adoption. So I changed adoption agencies because the one I was using didn't have a well establish Kazakhstan program but CHI (Children's House International) has been in KZ for years. Kazakhstan was actually my first choice when I start looking into it but I didn't think I could be gone for as long as Kazakhstan required. That's what I get for thinking! WARNING! !DON'T BOTHER TO READ THE REST OF THIS IF YOU DON'T HAVE AN HOUR OR DON'T CARE TO LEARN ABOUT THE ROLLER COASTER RIDE OF GETTING APPROVED FOR ADOPTION IN KAZAKHSTAN AND WHY IT'S TAKEN OVER A YEAR TO GET THERE. SORRY IT'S SO LONG, BUT I FEEL BETTER FOR HAVING WRITTEN IT! So March of 2006 I paid my application fee (my first of many, many, did I mention many fees) and started on the mound of paperwork required. First was the home study preformed by a local (well JoAnn's actually from Bellingham, which is on the Canadian boarder) social worker which included a visit to my home and then one to her office up north. Now that I think about it the 3 hour trip to her office was the shortest distance I've had to travel for any of this process and she is the ONLY person I've met in person so far. Everything else has been done by fax, email or phone. Talk about a leap of faith. At the time, I thought I was so lucky that JoAnn got my home study done in just a few weeks which is much quicker than average. Little did I know that was going to be my only "lucky" break when it came to paperwork. Once I received the notarized copies of the home study around the first of June, we were off to Yakima - yes the lovely desert town on the other side of the state - because we were told that was the closest place in Washington that you can go to get fingerprinted by the FBI. I found that odd since I live less than an hour from Seattle which seemed like it should have had an INS office since it's the largest city in the state, compared to Yakima which is one of the smallest and I must say one of the saddest little towns. Oh well, I'd been told from the beginning not to question, just do what I'm told, as they have done this many times and know how to make this process smoother and faster due to their experience. Yeah, I don't do that so much any more. But I regress. You might have noticed that I said "we" had to go get fingerprinted. The rule is any person over the age of 18 that lives in your home for longer than 6 weeks must be printed by the FBI along with the adoptive parent. Fine, I'm glad to know that the government is doing their best to make sure these children go into a safe home. So off Mom & I go, leaving in the late afternoon then staying in a lovely hotel (the pictures of the hotels in Kazakhstan that I've seen are much nicer than where we stayed so I think they were just testing us to see if we were up for roughing it in KZ.) The hotel is near the INS office so we could be waiting in line bright and early Friday morning. No appointments can be made - we simply must wait in line. Did I mention that I had recently adopted two puppies from the pound, Kit & Kaboodle, so of course they had to come with us. They certainly made the trip more entertaining (and longer due to potty breaks and the night shorter for the same reason.) So anyway, we were told to be prepared for an all day event and you can't take in a purse or briefcase, food, water or cell phone even though they search you and have you go through a metal detector. Well, we were pleasantly surprises to find just 4 or 5 other people there and we were in and out in under an hour, minus $656 per finger printing - have a nice day! The kind of fingerprints the FBI takes are computerized verses the old ink process - for those of you who have been printed by the police, well the FBI is a much better way to go since there is no ink to clean up and of course no jail cell to sit in afterwards. We felt blessed and went home to wait for the results. I had plenty to do while we waited since I had a ton of other documents I needed to get together to complete my Dossier, which is required by the Kazakh government. Things like 5 notarized copies of my birth certificate, yeah right. I've got them in my file cabinet just like everyone else - don't you? - local police clearance, so yes we got to the do ink fingerprinting but no jail time to follow, a letter from my employer, a deed of my house, a letter from my bank stating how much money I have (which is considerably less now I might add), then a financial statement listing all my other assets that are dwindling, a letter of support from my family (which they couldn't be more supportive so that one was easy - thanks everyone), an appointed guardianship in case I don't live through this process (that is a very real fear right about now), a letter saying I agree to send a report to someone in the Kazakhstan government every year until the child turns 18 and then the child can decide if they want to stay an American citizen or become a Kazakh citizen, if they are a boy then they get to join the KZ army for three years (now there's a reason to decided on a Kazakh citizenship), a letter agreeing to allow monitoring (I'm not sure what I've agreed to have monitored but it's signed and notarized so I guess I can't complain if someone moves into my house to "monitor" us), a letter stating that I'm a heterosexual woman and I still hope to find a man to complete my life (which is true, so hey, I now have government approval for that), a letter stating I intent to adopt (like I'd go through all this and change my mind), a letter committing to allow "visitation rights to Representatives of the Kazakhstan Consulate in the US & officials from Kazakhstan up to two times a year until the child is 18" (wow I have to say I never read that one closely so I'd better get the spare bedroom ready for guests), a letter committing to register the child in Kazakhstan before I leave the country with her (okay that seems reasonable but does she get a license or something), pictures of my house and family (no pets though as they eat dog and horse so the agency suggested that we don't mention them or have pictures of them in the dossier - they might think it's a menu - just kidding really!) Now two of my favorite things to sign were the BLANK power of attorney letters. Oh did I mention I had to get a Medical form filed out by my doc asking if I had, among other things, "sever dermatitis with the disturbance/breakdown of callusing" or bladderworts, or severe syphilis not cured, gonorrhea not cured or urogenital chlomidosis not cured (I would hope if my doctor found any of these during my exam that they might cure them - plus I'm not sure I'd be well enough to consider adoption but it might be the reason I don't have children of my own) but my favorite that I thankfully don't have is LEPROSY!! Boy was I relieved to hear that. Then my next assignment towards getting clearance to adopt was to talk to a Psychologist so they could determined if I was mentally stable enough to adopt (no -you all don't get to express you opinions on that one.) Again, I think it's a great idea to protect these children. But what transpired was a half an hour conversation on the phone with a nice Psychologist that had recently adopted an 8 year old little girl from Russia - which I thoroughly enjoyed hearing all about - after which I was told that I sounded like I'd make a great mother. That will be $565 please, have a nice day! With all do respect to the Psychologist, I don't know what else she could have done short of spending months psychoanalyzing me and ending up with the same results (since in fact, I'm going to be a great mom - if I can ever get this child.) Anyway, these few little paperwork assignments along with a number of other boring requested were keeping me busy not thinking about the FBI fingerprints. After around 5 weeks of waiting for my approval from the FBI, I did take note that I hadn't received anything and talked about it with my US coordinator, Erin, who happens to live in North Carolina and has been great keeping me straight on all of this. At first she said not to worry that it often took a while but since I really hoped to be in Kazakhstan by October (see - I am a dreamer) I wanted to know if I could do anything to check on the progress. I mean really, they just need to check our prints against a few million other people living in America - how hard could that be? So I first checked with the FBI who told me that my prints had been cleared by them 28 seconds after they were taken (who said our government isn't efficient?) and that Mom's had been rejected within a minute 27 seconds. Yes I did say rejected. The FBI said that they informed the INS of the rejection at that time (while Mom was still sitting in their office they knew there was something wrong with her prints but of course didn't think to let us know.) The FBI agent said that it wasn't uncommon but Mom needed to have them retaken. After I calmed down a little bit, I called the INS in Yakima since I'd not received any word that there was a problem . This was my first meeting with my favorite (yes I'm using that term loosely) INS officer, Agent Angela. Now she is a shining example of American efficiency at work. She told me that yes, they knew that mom's prints had been rejected and she sent me a notice but didn't hear anything back. Now you might think she would have sent another notice or given me a call or something but no she said she assumed (do I need to say anything more) that I had changed my mind about the adoption. I was speechless...for a few seconds and then I'm sure Agent Angela wished I was still speechless. Since children may be reading this we'll just move on to the results of our conversation. Mom has to be reprinted but low and behold, there is an INS office in Seattle and we can go there if we liked. As much fun as Yakima was, we opted to go to Seattle. Now this was a much bigger office and we expected to wait but we again were in and out in about 40 minutes. They wouldn't give us the results right then (even though I now knew that the results are instant) but we could look for them in the mail in the next two weeks. This was the end of July, so Mom was off to help Angie, my sister, Jim & the kids move from Charlotte NC to Houston Texas. While she's gone I found out that her prints had be rejected again. Agent Angela informed me that about one percent of the population actually can't be printed because their grooves aren't deep enough. Of course, Mom is in that one percent (I always knew Mom was special but in this case I wish she weren't quit so special.) Just a few days before I heard this from Agent Angela I had gotten Mom's rejection notice from the local police as well, so when she asked if they had any luck with the ink prints I knew that didn't work either. After many conversations AA & her supervisor (she would not let me speak to the supervisor no matter what I said and I said a lot) Agent Angela decided that they would approve mom if she would swear to her answers on this form asking certain questions in front of an INS officer. I explained that Mom was in Charlotte right now and asked if she could go to the INS office there or have it signed in front of a notary or attorney (you would think they would be a little more official, right?) Again she had to check with the supervisor blah blah blah, but no Mom has to do it in front of an INS officer. Okay but there is no INS in Charlotte. The closest was like 3 hours away. Needless to say my sister was not happy about this as the movers where coming the next day. So I found out there was an INS in Houston and you can actually get an appointment there so I set them up with one the next week - two days after they got to Houston. No one can suggest that I'm not supported by my family since my sister dropped her children off on their first day of school in a new city after sleeping on the floor of their new home since their moving van wasn't there yet and drove an hour and a half to find this INS office. I had faxed them the form and when they presented it to the INS officer there - you guessed it - he refused to do it. He said he'd worked in that office for 35 years and never before seen that form or heard of anything like this. They begged him to check with his supervisor but he just laughed and said no that they had more important Home Land Security issues to deal with than asking my 67 year old mother if she'd "every received a ticket from a police officer?" (Please note she had in fact received ONE speeding ticket back in 1968 but she took the class to have it removed from her record.) Thanks again Angie and Mom for trying. They felt so bad and I was beyond ticked but when I talked to Agent Angela she said I'd just have to wait until Mom was back in Washington. After all she had a box to check and my adoption couldn't go forward until she could check that box. So 3 weeks later Mom is back and I take her to the Seattle INS office again. The officer there also said no at first but I guess I sounded more desperate than my sister because after about an hour of him checking with supervisors (I think he took a lunch break too) he agree to take my mom's statement, signed and stamped it and sent us on our way. I told Mom that she really missed her calling. She could have been a theft or a spy and no one would have caught her. What was so dumb about all of this is, of course, they did a background check and knew that she didn't have a record either locally or federally. When the FBI checks your finger prints they are checking to see if your prints show up in an unsolved crime, so it's not like her signing that form would have made any difference. If she had committed a crime she would have, of course, lied to the agent. Anyway, I finally got the approval Oct 25th. So much for being in Kazakhstan in Oct or Nov. But somehow I was still optimistic about all of this and hope to go before Christmas. After all this was the last thing I was waiting on to complete my dossier. Now I just had to take everything to our state capital in Olympia and get them apostilled (it's a stamp that basically approves the notary that approved the signatures on the documents) which is required on every document by the Kazakhstan government. One thing that was funny was even documents that didn't have a signature, like the local background check that I got on line, had to be notarized and apostilled. So once there, I had to go to the local Kinko's and sign the documents stating that they are "a true and accurate copy." Then it would be notarized so that it could be checked and Apostilled. Remember when they said just do what they ask and don't question it. Well this was a perfect example. So I went back to the Secretary of States office and told them what I needed and what country I was adopting from., The clerck said no problem it will take about an hour. I come back in an hour and each page now has two more pages attached to it with a pretty gold stamp. She said we are all set that will be $560 please, have a nice day (funny how that happened to be the magic number!) And off I went back to Kinko's to make 4 copies of each page including the new apostilles and overnighted the originals and 2 copies to my coordinator - did I mention she's in North Carolina so I couldn't just drop them off- and sent one copy to the main office in Ferndale WA and I kept one copy for myself. I was told they would review them to make sure they were all correct and off they go to Kazakhstan to be translated. From there they are sent to the Kazakhstan Embassy in Washington DC to get approved then back to Kazakhstan to be submitted to the Ministry of Foreign Affairs, MFA. Erin received it Oct 31, 2006 and sent it off by Nov 3rd. What a relief!!! Finally it's all on its way and just in the nick of time. Erin, my coordinator, was due to give birth in a week and she was taking a little time off for that (the nerve of some people thinking the birth of their child was more important than some paperwork of mine!!!!!) Anyway, I could finally relax and start thing about the trip since I just had a few more documents the KZ or the US government needed before I left. Now according to the schedule they gave me when I started this, it should only take 1 to 2 weeks to translate. On Nov 27th, after Erin gave birth to a healthy baby girl and she was back at work again, God Bless her, I email to see if she had any news on the dossier. On Dec 4th she said the dossier was translated and back in the states. They would present it the next day to the Kazakhstan Embassy and it should be released in two weeks. Great news because we really needed it to be out of DC before the holidays so it wouldn't just sit there. So Dec 5th I get a long email from Erin and then a phone call saying that the dossier has been rejected because that nice woman at the Sec of States office put Certificates of Authenticity not Apostilles on all of my documents. So I have to get the correct Apostilles then send it back to Erin who will send it back to Kazakhstan for translation and then back to DC for approval. Erin said she'd never had this happen before - just like she had never had any ones prints rejected unless they were actually criminals not Grandmas with small grooves in their fingers. Unbelievable!!! Needless to say I was a little upset. I mean isn't that why you hire an agency to make sure these kinds of mistakes don't happen? Erin is from North Carolina and she deals with people from all over the country so doesn't know what a Washington State Apostille looks like (each state has their own) but the Ferndale WA office got a copy and should have looked at them. Plus Erin said when she talked to the WA office that they had had this problem before and they had a letter they meant to give to anyone going down to get their apostilles in Washington state. We'll the fact that they could have prevented this really sent me through the roof. But whining about it doesn't get it done. So anyway, the DC agent was overnighting it to Erin, who was going to take it apart - evidentally the Kazakhs put ribbons and stamps all over them - so she had to take all that off before she could send it on to me. It was a Thursday when I heard so I knew I wouldn't get it before Monday if I was lucky. Anyway, I called around and found the lady that "helped" me before (thank goodness I made a copy of everything) and told her what happened. She said and I quote "Bummer" but she'd be happy to replace them on the copies (that way I wouldn't have to wait on the originals being mailed) if I drove on down tomorrow (it was after 4 so I couldn't make it in time) and she wouldn't even charge me. Like that was going to happen! So I rearranged my schedule (I did mention that I was actually working during all of this and that I don't live off a trust fund like everyones favorite heiress Pairs Hilton) and drove down, got them re-apostilled or should I say correctly apostilled, had 4 more copies made (by the way it's over 60 pages without the apostilles) and overnighted to Erin. She got them off but heard nothing before the holidays. But on Dec 26th she emailed to say they were in DC and would be presented tomorrow and hoped they'd be released in two weeks. So then I hear nothing until Jan 17th when Erin hears that the dossier is actually already back in Kazakhstan and being submitted to the MFA, Ministry of Foreign Affairs. That's great news!! She said they hoped to be looking at referrals for a child by mid Feb and I'd travel soon after that. She sent me the travel info and tells me to get my hand carry documents in order (yes they want more documents that have to be dated last minute and of course apostilled) and start getting ready to leave. Wow I finally get a break - I think!!! 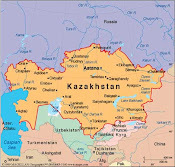 Next on Feb 13th I hear from Erin that Svetlana, the international adoption coordinator for all of Kazakhstan, is thinking of sending me to Aktau, a city on the Caspian Sea that has just opened up for international adoption. Of course, I've looked into most of the areas where other families have adopted from so I'll have an idea of what to expect. But since no families have been there for supposedly a dozen years, I can't find anything out other then general information. Oh well, I'm good to go - sign me up - I'm outta here!!! Then more good news. My dossier is being submitted to the MOE, Ministry of Education, the last stop before I can leave. They will review my dossier and then issue the famous LOI, Letter of Invitation, to come to their country to adopt. I found out that I'm in a group of four families with CHI that have been approved basically at the same time. They are sending the other 3 families up north to Uralsk on the Russian border and me to Aktau along with another family that was supposed to leave just a week or so before me and they were leaving the following week. So that means I could be leaving in just a few weeks. WOW, what a rush. Of course, I had 9 deals in escrow (I'm a real estate agent) so work was crazy but I would manage no matter what happened. I remember wishing that I wouldn't have to leave before Mar 10th when my last deal would close. Be careful what you wish for!! One of the items I had to take care of was to update my medical and employment letters, have them notarized and you guessed it apostilled. So I go back to see my doc who thankfully tells me I haven't caught Leprosy or had any uncured sexually transmitted diseases in the last 6 months. That was a load off my mind. Then I'm off once again to the Sec of States to give them more money in exchange for little gold stamps. I completed those tasks along with the 11 other hand carry documents that I have to...you guessed it, hand carry on the trip. Another item I was told to check on was to make sure the US Embassy in Almaty Kazakhstan had the documents from the Washington state INS stating that I had been pre-approved for adoption. I sent off my email requesting confirmation that they had received it and.....drum roll please...of course they didn't have them. I'm told to check with the INS office I'd originally gone to. And you thought I was done with Agent Angela (and believe me so did I.) So I called her and at first she doesn't know why they wouldn't have gotten it but she agreed to check it out for me. Later she calls me back to say that I'd check a box (yes one of her famous boxes) so they didn't send it to the Embassy. Now I have to ask, if it's not sent to the embassy can I complete my adoption. Well, no I can't. Then why would she not ask if I had made a mistake or something by checking that little box? For that matter, why is the box there in the first place? I did mention that international adoptions is all she does, right? This is her job. She actually gets paid to do this so that makes her a PROFESSIONAL. Anyway, we finally clear up the mystery that I do in fact want to adopt and she sends it off to the embassy. I hope working with the Kazakh government employees proves more successful. Now I think I mentioned the last thing I needed was a LOI from the MOE to get OTP (On The Plane.) Well, I got an email from Erin at the end of Feb that the MOE is on the move. They are moving offices so they were NOT issuing any LOI's until further notice. So it IS just like working with the American government. My biggest concern was that they were moving to the new capital of the country in Astina from Almaty where they and the American Embassy are located right now. I mean, if your moving down the hall it's one thing but to move 500 miles across the country, I could be looking at leaving in 2008. Come to find out they were moving to a building across the street (not as bad as across the country but I was really hoping it would be to the office next door.) So I'm on hold until further notice. The family that was supposed to leave for Aktau on Feb 23 (Joe & Stephanie) also can't leave but I hear a week later that things are back up and running. So they should leave by March 7th and they hope to have more information on children for me and when I can leave. Hopefully just a week after Steph & Joe. Well they do leave on the 7th but me they just don't know yet. On that note, I think I'll stop for now and resume the rest of the tale later. Thanks for putting up with the long winded prose for those of you that stuck around.